These units are still excellent today, but after 50 years or so could stand a little work and many which supposedly work correctly, don't. 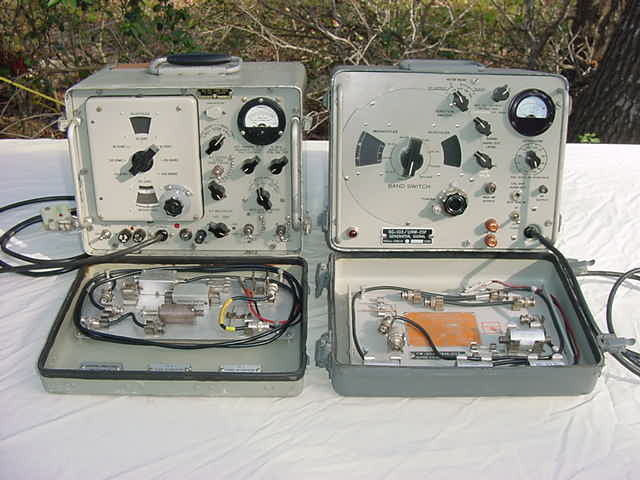 I'm told Dallas Langford published an excellent "URM-25 Notes" article in the Hollow State Newsletter which is mandatory reading for those wanting to really restore their URM-25 signal generators. Manuals for both the URM-25D and URM-25F (and a heck of a lot of other stuff) are available from me on the HBR Receiver CD for $10 postpaid in the US or $12 Worldwide. Are the fuses OK and switches set correctly ? ....wish I had a $1 for each time..... The "X-MULT" switch on the -25D must be set to the correct band being used or the waveform will be distorted (easy to forget). The "SET CARRIER" control (on the -25D) or the "RF OUTPUT" control (on the -25F) should be set to indicate full scale on the meter with the "Microvolts" control set to max (fully clockwise) ...then use the "Microvolts" control to set the desired level. These setings will vary substantially from band to band. Sometimes backing off on the "SET CARRIER" control some and increasing the "Microvlts" setting, results in a slightly cleaner waveform. Does the meter work in the 400/1000 Hz modulation position....if so, the audio oscillator and modulation circuits are probably OK. Does the meter read RF in the CW position....if so the RF section is probably OK. Does the meter read RF output on all bands....if not, it's probably a dirty intermittent contact on the wheel and requires cleaning/lubrication (DeoxIT). Do the switches work smoothly....if not, they probably require some cleaning/lubrication (DeoxIT). This also applies to tube socket pins which can become intermittant due to oxides over the years. Take the front panel off (rock it back and forth so any protruding screws clear the lip on the rear cover) and disconnect the two power plugs on the -25D or the one power plug on the -25F. I have found one unit which came "pre-unplugged".......wonder why it didn't work ? This is also a good time to remove some of the inevitable dents in the cover. Aluminum is very easy to "work". When reinstalling the front panel, don't pinch the power cords between the panel and the rear cover lip. If you have non-operation on some bands, the spring fingers are probably not making good contact on those bands. Two -25F units required moving the wheel with all the tuned circuits 1/16" inward to make good spring finger contact. Check the tubes, there are 9 in a -25D and 8 in a -25F. Some are quite difficult to remove but keep rocking/pulling them until the come loose. There used to be a puller available for situations just that. If you have one, lucky you. It's best to check the tubes on a Dynamic Mutual Transconductance tester (TV-7, nearly all Hickoks, B&K 747, and many others). When reinserting miniature tubes where you can't see well, the little tab on the socket shield indicates the location of the pin gap (between pin 1-7 or 1-9). On the -25F, remove the large capacitor (that's what the wing nuts are for) so you can get to the last 3 tubes. Visually inspect the wiring. I have found -25D and -25F wires which were never soldered (apparently passed QA when the wires still made contact), broken solder joints (one which was held together with Scotch tape and another which was apparently part of a repair process which was not completed). The most likely points are those which require de-soldering for sub-assembly removal (like at feed-thrus, etc....especially the one feeding V102 on the -25D). The large "Mica looking" caps on the -25D are really moulded paper capacitors and are notorious for leaking. Some units will already have them ALL replaced (good move). These are the brown rectangular capacitors on the -25D circuit board, the two closest to the attenuator are .2mfd, the two at the other end are .1mfd, and the smaller ones are .01mfd. Sometimes you can see them actually "oozing" some fluid (which it's probably NOT good to ingest). Out of 17 of those caps tested, 16 leaked ....some indicated excessive leakage at 25V. Best to replace them all. The number of times you will take your AN/URM-25D Signal Generator apart to fix it, will be directly proportional to the number of these capacitors left. On the other hand, I have yet to see one of the smaller value Mica capacitors which was bad but the sample size is small. One of the -25F units would loose modulation after about 20 minutes. Thought it was a bad mode switch because after disassembly and cleaning, it worked again. Turns out it was a leaky cap affected by heat. Good idea to replace all the tubular .01mfd, .05mfd, and .1mfd caps on the audio board (they all showed some leakage) .....no more modulation problem. OK to use disk caps since this isn't high fidelity and 600V tubulars are hard to find. The cathode resistor bypass capacitor on the 6AG7, if leaky or open, will dramatically alter the RF output. Check for B+ at any convenient point ***Careful and don't get across exposed voltages** and filament voltage. I have not found any power supply problems on the 7 units I've looked at. The electrolytics have been found to be darn good and a little extra leakage in power supply electrolytics does not hurt any function. A quick way to check for a leaky capacitor is to power the unit up without the tubes installed (except for the voltage rectifier and regulator). ***Careful and don't get across exposed voltages***. Measure every tube socket grid pin (from either the top or bottom). It doesn't take much current through a 1Meg or 100K grid resistor, due to a leaky coupling capacitor to the previous stage, to bias the tube and cause signal distortion. Measure the tube plate voltage which should be the supply voltage (there is no load with the tubes pulled). If you do see a drop you have a leaky bypass capacitor in the plate circuit. The tube screen voltage should measure the same on both sides of the screen dropping resistor. If you measure a voltage drop you have a leaky screen bypass capacitor pulling current through the screen resistor. The recommended debug sequence is just like on transmitters, from the oscillator out. Check the signals at the grids/plates, when you note a problem, it's probably the previous stage. There were several changes throughout production, so the schematic you have might be slightly different from your unit.